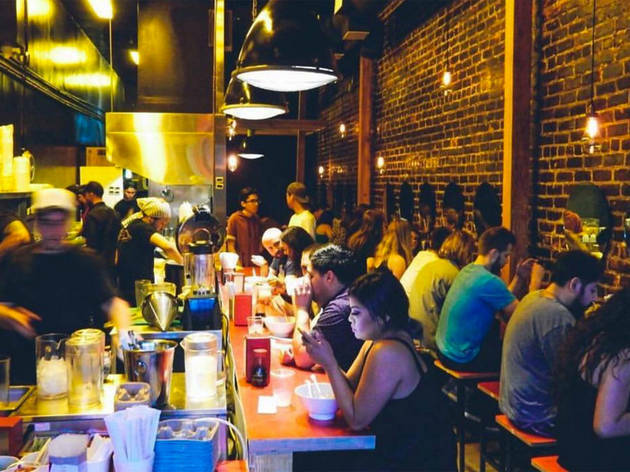 Highland Park’s first ramen destination comes from the team behind the ever-bustling Silver Lake Ramen. 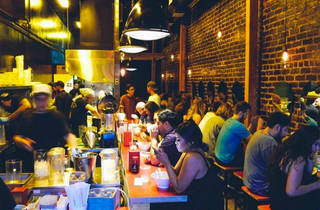 The noodle shop is refreshingly sparse with red-topped stools lining the kitchen and narrow counters along a brick wall. The menu shifts the focus from the popular pork-based tonkotsu broth to a milder—yet still delicious—chicken variation that’s available clear (tori shio) or creamy (paitan). There’s also a hearty vegetarian version, as well as the tsukemen dipping noodles. For variety, there are rice bowls (also available with quinoa), including pork belly or mabo tofu. While there’s no booze, you can sip Japanese-inspired aguas frescas that nod to the neighborhood with options like the spicy togarashi jamaica and yuzu-spiked Japanese colada.